Today Bean and I decided to pack up the whole family and head out to get the few clothes and shoes Miss Rose needed for school. Certainly one of us could have stayed home with the little ones, but what fun is that? When we have the opportunity, I like going out as family and teaching the kids how to handle themselves and behave in public. But, you know it was a 3-ring circus. Starting with the van ride. Miss Rose has a booster seat that is in the car at times, especially when we have had someone else with us. Gracie wanted to ride next to Miss Rose, so we buckled her into Miss Rose's carseat. Of course they had toys back there, that they immediately began to fight over. We had to drop something by Grammie's house first, at which point I put Gracie back in her carseat, which is on a different bench in the van. Then Bean decided he was going to need a McDonald's Diet Coke if he was going to last the trip. So we shared one! Yes, we often drive through McD's just for an 86cent large beverage. It's how we roll. The first store was a bust. The second store had much more to offer. But Miss Rose detests shopping and getting her to try on clothes is the equivalent to wrestling a bear. While I coached Miss Rose through the trying on of clothes (my Kindergartener wears a SIZE 7 in girls), Bean watched Gracie run around clothing racks while bopping to the music. By then Lily decided she was done waiting around and was in Bean's arms and the stroller simply served as a great place to hold our purchases. For Miss Rose, choosing tshirts is as bad as eating brussel sprouts, and slightly painful for us too. She is still obsessed with all things boy, which eliminates many options. Finally we found a few tshirts, in her size, that were designed for a girl, but satisfactory for her. Like this one. Shopping with a potty-trained 2yr old means many bathroom trips. The first was suggested by me, while Bean waited in line. Of course Gracie has to touch every nasty thing in the bathroom, no matter how many times I say "don't touch the trashcan, don't touch the floor." 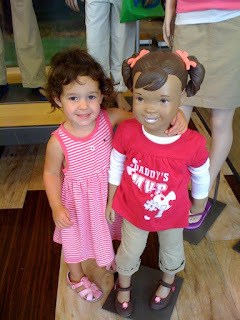 While I made our purchases, the girls were dying to visit the mannequin display they saw when we entered the store. And Gracie found her new best friend. Seriously, did they use my child as a model? Bean said Gracie started hugging on the mannequin and caressing her face. She was quite enraptured. You can even see in the photo how her hand is cupping the neck. We couldn't stop laughing! Finally bag in hand, we headed out in search of shoes. Lucky for us, we found some a few stores down. 10 minutes in, Gracie has to go the bathroom again. So I run her to the nearest bathroom. When do kids learn to pee and poop at the same time? We often make multiple trips to the bathroom because the coordination just isn't there yet. Miss Rose was thrilled with her classic Vans. Although now we really need to teach her to tie her shoes. 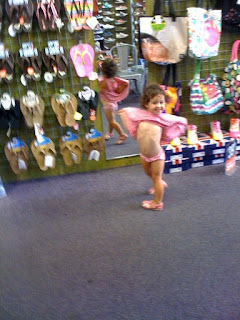 Gracie like the shoe store for the full length mirrors it offered. She was caught dancing and shaking her booty (a recent favorite activity and phrase of hers) in the mirror. When I tried to snap a photo of it, this is what I caught her doing. Clothes and shoes in hand, we made our exit before any major meltdowns or catastrophes occured. At one point Bean looked at me and said "I love this, it's hilarious." And it was. I highly recommend shopping with a 3-ring circus.